A stylish, elegant brawler with an absurd sense of humour. More of this sort of thing on PC, please. Don't know your shagohod from your la-li-lu-le-lo ? Then a lot of Metal Gear Rising won't make sense. It's an action-based spin-off of Konami's brilliant Metal Gear Solid stealth series, which has yet to appear on PC beyond a lacklustre port of the original, and continues the story set up in the fourth game. Mercifully, being familiar with the series' famously convoluted lore isn't necessary to enjoy what is one of the most thrilling, theatrical action games on PC. Rising is the PC debut of Osaka's PlatinumGames, the talented team behind console darlings Bayonetta, Vanquish, and MadWorld. They're known for their stylish, deep and absurd fighting games, and it's about time they made one for us. It's not their best - that crown still belongs to lollipop-sucking witch Bayonetta - but it's a fine example of a genre sorely underserved on PC. You play as Raiden, a silver-haired cyborg who wields a futuristic samurai sword that can cut through metal like it's spreadable butter. He's a whirling, robotic dervish of parries, combos and flurries, all of which are controlled by an elegantly simple combat system. You get two attacks, heavy and light, but you won't have to memorise endless strings of combos. Instead, the skill lies in parrying. Push in the direction of an enemy as they strike, hit the light attack button, and Raiden will - depending on how precise your timing is - either block it, or parry and hit back with a counter. Like the lightning bolts that appear over thugs' heads in the Arkham games, enemies will announce incoming attacks with a flash of red light, giving you a visual cue to prepare your parry. A yellow light, however, means the attack /can't/ be parried, and you'll have to quickly evade it. Nail a counter, or beat an enemy up enough, and you can perform a Zandatsu. I must have done this a few hundred times in my playthrough, and it never gets old. 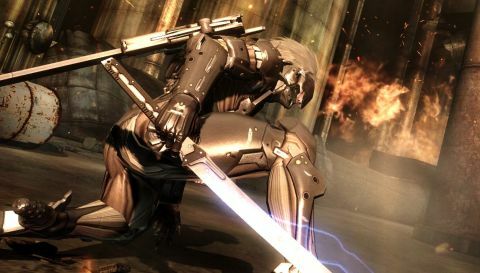 Raiden slices an enemy into ribbons in slow-motion, grabs their spine before they've hit the ground, and absorbs its energy, fully restoring his health. It's an incredibly satisfying move, and beautifully animated. You can also slice up the environment with your sword in Blade Mode, which will add a good hour to your playtime. It's seriously impressive tech, allowing you to carve cars, trees and other objects up into hundreds of tiny pieces. That's the core of the combat. It's fairly basic on paper, but not when you're being piled on by groups of enemies, all of whom have different timings and attacks. This is where the challenge lies, and it can be an incredibly tough at times - especially fighting the bosses, which are brilliantly over the top. You'll dance across missiles mid-launch while battling a giant robot, slice tanks in half as they're thrown at you, and wrestle with a superhuman US senator. It's totally mental, with that that distinct, rarely-seen-on-PC spark of exaggerated personality you only get in Japanese games. The only thing that dulls Raiden's blade is the camera. It's atrocious, and often jerks around erratically when you're in the thick of a fight. This is a problem when groups of enemies are coming at you from all angles. The environment design is also drab, and at odds with the extravagant combat and characters. It looks nice in places, but there are a lot of sewers and grey warehouses to slog through. Those gripes aside, Rising is a welcome sight on PC. Its snappy, responsive combat looks and feels great, and it's wonderfully insane. Now, can we have Bayonetta next, Platinum?